A unique, turn-key furniture design and manufacturing company. With over 16 years of service, we are dedicated to our customers and our product. Since we have our own factory, we monitor the entire process from conceptualization to realization, ensuring the highest quality and satisfaction for our clients. Delta Hotel by Marriott Daytona Beach Oceanfront has recently been selected from among over 400 entries as a finalist in the Best Guest Room Upscale category of the prestigious 2018 Gold Key Awards for Excellence in Hospitality Design. 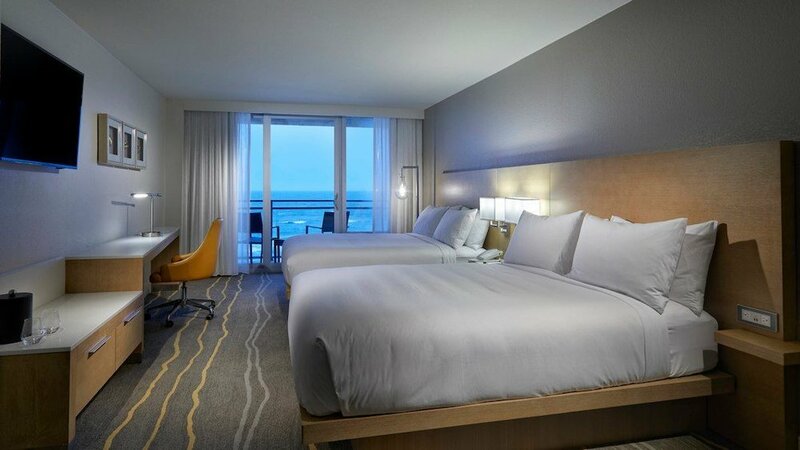 Boasting stunning views of the Atlantic Ocean, the new Delta Hotel Daytona Beach Oceanfront is the oasis just minutes from the heart of Daytona. With clean lines and a bit of a modern approach, this project has custom designed furniture with integrated lighting and electrical ports. The symmetry is a beautiful juxtaposition from the crashing waves of the ocean right outside. Great for all the family and large groups of friends, booking self-catering holiday accommodation at CLC Regal Oaks makes perfect economical sense eliminating the need to book 2 or 3 hotel rooms that families of 6 or more often require! Regal Oaks has modern interiors and comes fully equipped with many refinements for your comfort. Encantada – Spanish for ‘enchanted’ – is one of two CLC World resorts in America’s theme park capital. Conveniently located for great days out at the area’s most popular attractions, Encantada offers spacious, comfortably furnished townhouses set in green, tranquil surroundings made for relaxing after a long day’s excitement in the parks. RiverWalk is a new and exclusive resort complete with breathtaking mountain views and full-scale luxury amenities. By combining classical lines with rustic charm, each item made for RiverWalk was designed to embody the resort's ambience of comfort and sophistication. Staying true to its namesake, this expansive oceanfront condominium property boasts an assortment of family-friendly amenities ranging from meticulously kept and spacious rooms to a private beach area. For this project, subtle design was implemented in the richness of the walnut wood finishes to the stark contrasts against the soft, breezy color scheme to create a blend of utility and style in harmony with the resort's motif. With panoramic ocean views, legendary amenities, and modern luxury ­­­– this serves as a front row seat to one of America’s most famous beaches. We worked very closely with the owners to create an extremely unique design for this hotel. We customized all of the lighting on this project. There is seamless integration of the lights and electrical ports into the custom furniture. The result is a gorgeous, opulent functionality you have to see to believe.